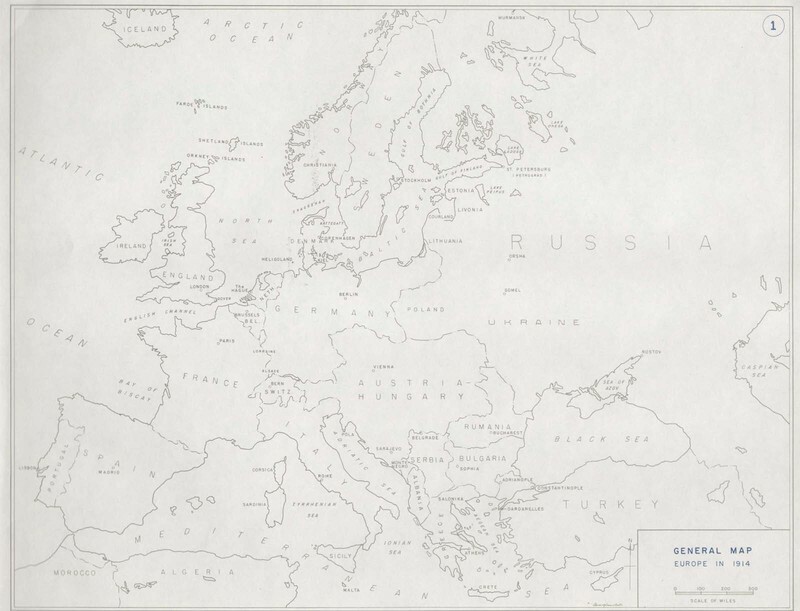 A map showing the 1914 borders of European countries before the outbreak of the First World War. On June 28, 1914, Archduke Franz Ferdinand of the Austro-Hungarian Empire, and his wife, Sophie, were assassinated while traveling in Sarajevo, then part of the Austria-Hungary. One month later, on July 28, 1914, Austria-Hungary declared war on Serbia, believing that the Serbian government was responsible for the assassination. Complicated international alliances across Europe, which had been formed over the previous decades, soon drew all of the major powers of Europe into the conflict. After Russia began to mobilize its troops in support of Austria-Hungary, Germany declared war on Russia on August 1, and then invaded Belgium and Luxembourg. On August 4, the United Kingdom declared war on Germany, as that country continued its march toward France. Germany and Austria-Hungary, later joined by the Ottoman Empire, became known as the Central Powers; while the United Kingdom, France, Russia, and later Italy united as the Allied forces. On August 4, 1914, the same day that the United Kingdom entered the war, President Woodrow Wilson officially declared America’s neutrality. Despite America’s large immigrant population with strong ties to Europe, most Americans favored neutrality. Both the Allies and the Central Powers attempted to sway America to their cause, while simultaneously preventing her from aiding their enemy. Britain, in an attempt to prevent American commodities from reaching Germany, declared all cargo in neutral waters contraband, and began seizing goods from ships. Germany retaliated by declaring unrestricted warfare on all ships that entered British waters. In March 1915, a German cruiser sunk the William P. Frye, a private American ship. On May 7, 1915, Germans torpedoed the passenger ship Lusitania, killing 1,201 passengers, including 128 Americans. Despite the fact that that the Lusitania was, in fact, carrying war munitions from America to England, Germany still apologized and pledged to end unrestricted submarine warfare. However, the attacks continued, and in March 1917, Germany sank four more American ships. Popular media celebrated America’s neutrality. 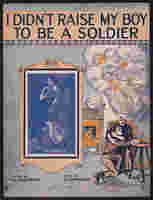 Songs like “I Didn’t Raise My Boy to be a Soldier” were huge hits, and Americans reelected Woodrow Wilson in 1916 on the slogan, “He Kept Us Out of the War.” After the U.S. entered the war in 1917, the lyrics of the song were changed to “I didn’t raise my boy to be a slacker.” Courtesy the Library of Congress. The deaths of Americans resulting from the sinking of the Lusitania and other ships began to turn the tide of American public opinion against Germany. It was these deaths combined with the publication of the Zimmerman telegram that brought the situation to a head. 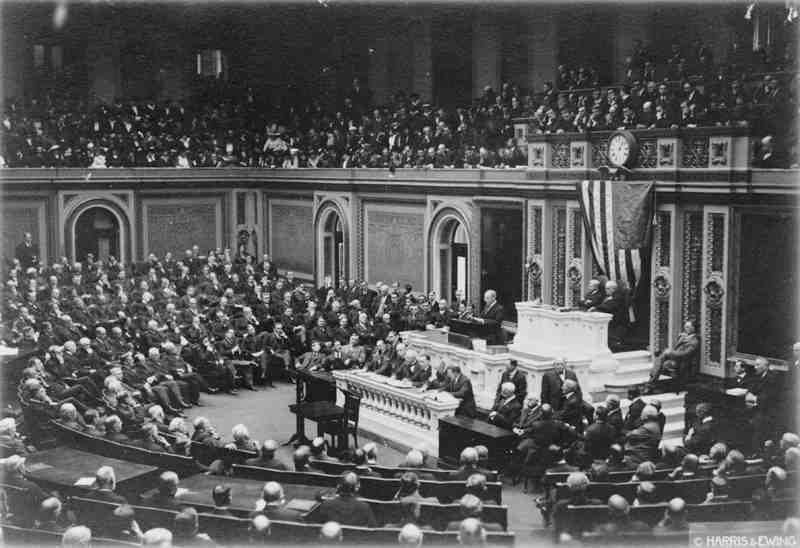 President Wilson addressing a joint session of Congress on April 2, 1917. Courtesy of the Library of Congress. On April 2, 1917, President Wilson appeared before a joint session of Congress to request a declaration of war against Germany. On April 6, with only 6 senators and 50 representatives voting against, Congress officially declared war, and the United States entered the European conflict. By this time, most Americans felt that going to war was the right thing to do. Many believed that since America was the only nation truly committed to the ideals of freedom and democracy, the country had a moral imperative to join the war. When President Wilson addressed Congress on April 2, he asked them to declare war so that the “world would be made safe for democracy.” He turned the question of entering the war into one about whether or not America was prepared to stand up for its ideals.